It’s no secret that Zion National Park is home to a magical landscape. Named as a place of refuge and serenity, Zion features deep canyons dissected by rushing water and lorded over by sandstone peaks. The park is the perfect destination for a long weekend with its picture-perfect scenery. You’ll find a rainbow of colors, brilliant sunsets, panoramic views, and a wide variety of wild outdoor adventures. While three days is not enough time to experience all of Zion’s natural wonders, it is plenty of time to get a taste of what Zion has to offer (and make a few plans for what to come back and see next!). Here are our suggestions for a getaway to Zion from Springdale, the friendly gateway to one of America’s best national parks. There are plenty of options for grabbing a steaming cup of coffee and a quick breakfast before hitting the area’s trails and sights. Deep Creek Coffee Company offers organic coffee, a selection of teas, and breakfast items. Temptations include fresh-baked goodies, the BRO-rito burrito, steel cut oatmeal, and popular acai bowls. Café Soleil is perfect for a sit-down breakfast before your morning adventure. Order a hearty plate of burritos or a breakfast scramble (vegan and vegetarian options are available) and a mug of coffee. Dine on the outdoor patio to enjoy the red rock scenery. Perks at Zion near the park visitor center is a handy go-to spot for coffee. A barista brews your specialty order, including strong espresso, a café Americano, or an excellent chai tea to jazz you up for an early hike. Pick up a pastry or bagel and head for the park. Visit the Zion Human History Museum to learn more about the region’s first inhabitants. Your first stop should be the Springdale Visitor Center, a mile from the park’s southern entrance, for insider tips on making the most of your stay. If you’re heading to Zion Canyon, the gorgeous heart of the park, plan on parking in town and riding the free Springdale Shuttle to the park’s pedestrian entrance or to the lot just inside the park entrance. Ask rangers at Zion’s Visitor Center for info on visiting the park, where to avoid crowds, and planning your day. 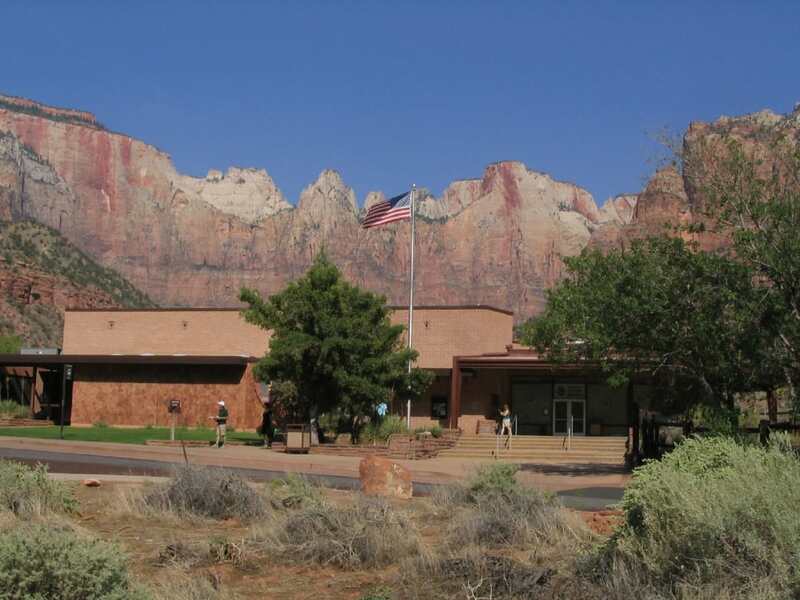 To learn about Zion’s history and geology, stop at the nearby Zion Human History Museum. Pick up the free Zion Canyon Shuttle outside the visitor center, which runs from March through November, to begin your journey. Zion National Park is made for hiking, with a variety of trails ranging from easy to more challenging, that take you to lofty overlooks, plunging waterfalls, and beneath soaring cliffs. Most of Zion’s best hikes begin at shuttle stops in Zion Canyon. Need a few recommendations? Get off at Zion Lodge and hike to Lower and Upper Emerald Pools and waterfalls. The Grotto is the jumping-off spot to hike the iconic Angel’s Landing Trail, a strenuous path that climbs to a rock-rimmed summit. The Weeping Rock stop accesses its namesake, a verdant spring tucked into a cliff. The Hidden Canyon Trail discovers a remote gorge behind the Great White Throne, and the Observation Point Trail switchbacks up to Zion’s most spectacular view. Riverside Walk and The Narrows of the Virgin River begin at the Temple of Sinawava stop at road’s end. Remember to bring plenty of water, wear a hat and sunscreen, and avoid hiking during the heat of the day. In the fall and winter, check the weather as you may need to bring an extra layer or two along. The Narrows is one of the most impressive slot canyons in the park—and a must-visit for anyone interested in canyoneering. Canyoneering, one of the park’s best adventures, is the sport of descending narrow canyons using a combination of climbing skills, backcountry hiking, and swimming to navigate their watery depths. Zion happens to be known as one of the world’s best places for canyoneering, with trips that range from easy wades for beginners to technical challenges for extreme canyoneers. 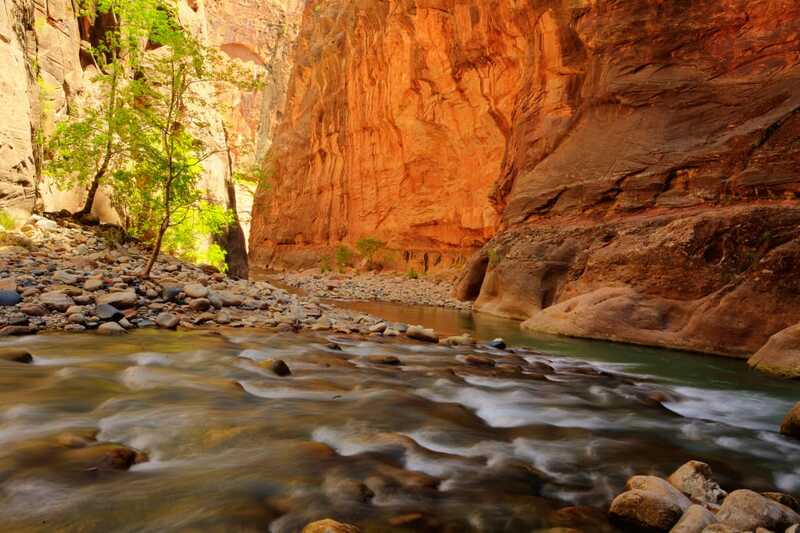 A short hike into The Narrows is a perfect introduction to Zion’s slot canyons. Experienced adventurers should head for the park’s famed slots, including The Subway, Orderville Canyon, Pine Creek, and the spectacular Mystery Canyon, a wild trek with twisting narrows and airy rappels. If you don’t have the skills to descend Zion’s canyons, take a course at Zion Outfitter to learn the ropes (literally) and then rent equipment for a do-it-yourself experience or take a guided trip outside the national park. Zion National Park is pedal-friendly, so don’t forget your bicycle! A two-wheel tour up Zion Canyon is an ideal way to discover the park since you’ll ride through some of the country’s most dramatic scenery. If you can’t bring your own bicycle, rent one in Springdale and hit the pavement via the Pa’rus Trail to the closed 7.5-mile road up the canyon. Each shuttle bus can transport up to two bikes, if you’d prefer to make a one-way trip and get a ride back to the start (or vice versa). A few other rules to note: Shuttle buses are not permitted to pass moving cyclists, so pull over and let them pass when they approach. Cyclists may not pass through the tunnel, so keep that in mind when planning a route. While Zion’s trails are for hikers only, take your mountain bike to the wild terrain west of Springdale. Gooseberry Mesa, one of Utah’s best mountain bike areas, offers miles of stellar singletrack trails with technical slickrock and cruiser flats, while Guacamole Mesa offers audacious rides beneath the shadow-filled Zion Canyon and Mount Kinesava to the east and the looming Pine Valley Mountains to the west. Springdale is filled with excellent dining options to enjoy after a day on the trails. After each day’s Zion adventure, head back to Springdale on the edge of the park. It offers loads of post-adventure restaurants, brewpubs, and hideaways to rehydrate, refuel, and remember the day’s excitement. For a town with a mere 500 residents, Springdale is serious about taking care of you and living up to its billing as the gateway to Zion National Park. The town, hosting most of Zion’s five million visitors every year, boasts a diversity of excellent restaurants, gift shops, and galleries, and plenty of lodging options from campgrounds to resorts for every budget and taste. 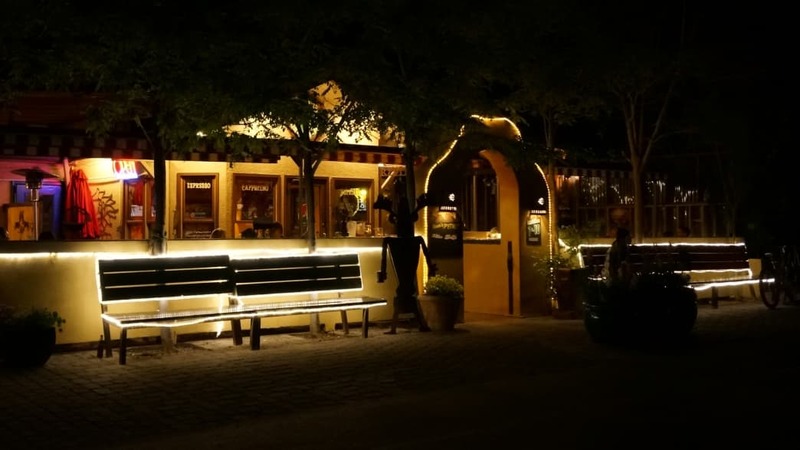 The Zion Canyon Brew Pub is a great spot where you can unwind and sip a cold, handcrafted beer on its outside patio as you watch the sunlight fade on Zion’s rock mountains. Find dinner at any of the restaurants lining Zion Park Boulevard, Springdale’s main drag. Great choices for an outstanding meal include Oscars Café, the Bit & Spur Restaurant and Saloon, Spotted Dog Café, Switchback Jack’s Sports Grille, and many others. A good night’s sleep is essential after hiking, biking, and exploring Zion. Springdale’s numerous hotels, motels, resorts, and campgrounds are the best places to rest your head on a comfy pillow and recharge for tomorrow’s fun. One of the best things about staying in Springdale is that you can park your car at the hotel and ride the Springdale shuttle into the national park. It’s best to book ahead of time, especially during the busy season, since places fill up with guests. You’ll find plentiful rooms at national chains like the Holiday Inn, Hampton Inn, Springhill Suites, and the La Quinta Inn, but there are also superb local options in Cliffrose Lodge & Gardens, Desert Pearl Inn, Flanigan’s Inn, Driftwood Lodge, Watchman Villas, and Cable Mountain Lodge. Or consider a vacation rental to suit a larger group. No matter where you stay in Springdale, you’ll have easy access to the park and lots of options to make your trip easy. A long weekend may not be enough time to explore it all, but it’s enough to enjoy the incredible natural beauty of one of America’s best national parks.